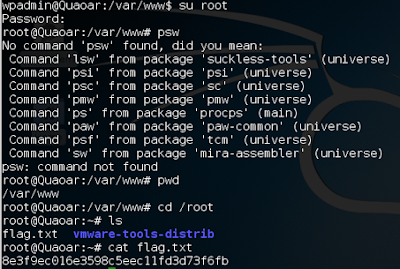 This is the first boot2root box I’ll be tackling in a series of boot2roots I’ll be doing to learn. I chose this one because it’s new, it’s beginner stage, and it’s got some helpful hints on Vulnhub to get you started. 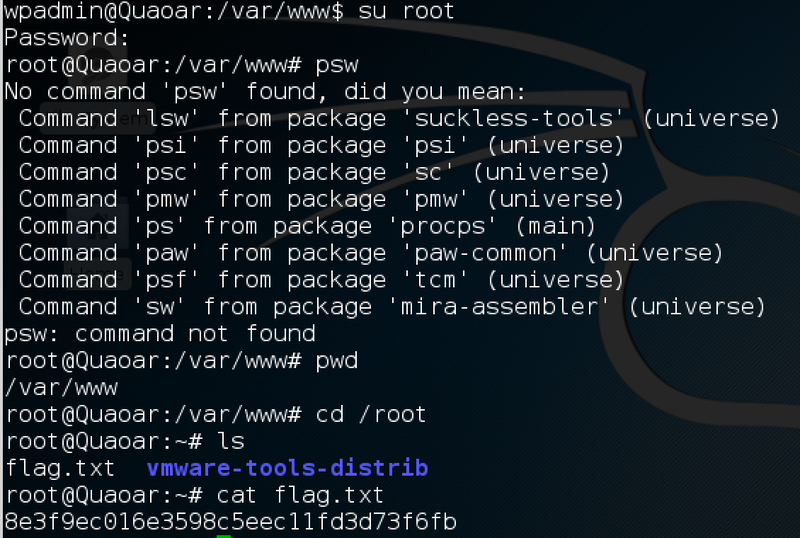 I’ll be documenting my findings and doing a write up of every box I attempt to boot2root from Vulnhub or other sources. This is both for my benefit and others that might get stuck in the future. Beware that I will have spoilers in these as they show how I gained root on these boxes. I’m using Kali XFCE with 20 gigabytes of hard drive space and basic default settings from VMWare. Nothing to special. The host is a 2014 Macbook pro running the Intel i7 chip. Only the Kali and boot2root VM will be on the same network. Nmap was one of the hints that the creator of this boot2root had mentioned to use so it’s where I started with. I almost always use the switches –Pn –sV –p1-65535 –A to start with on these boot2roots. Really deep dive the ports and grab headers. If this was a live pen test I likely wouldn’t make that much noise and would stick to top ports or try to find something more targeted from other sources first from pre-engagement. At any case the results of the nmap scan were as follows. |_ssl-date: 2017-03-24T13:30:07+00:00; 0s from scanner time. From nmap we know that we have port 80 open, so next I went to the web browser to see what I could physically see. Nothing of interest there, so I went to DirBuster next as it was hinted to use from the description on VulnHub. I ran DirBuster with the url of http://172.x.x.x:80 and navigated to /usr/share/dirbuster/wordlist/directory-list-1.0.txt. I let this run for 1-2 hours. Once I started seeing the wordpress stuff I figured that’s more or less what the creator wanted me to find to pivot to another tool. The next tool I will pivot to is wpscan. This will help us determine any vulnerabilities in the plugins and find all directories, themes, and plugins associated with the wordpress server. First lets make sure the database is up to date with a wpscan –update. Next is to run the actual wpscan agains the wordpress site ‘wpscan –url 172.16.13.128/wordpress’. I had to add the /wordpress because that’s where the wordpress site begins. This gives me some useful information about themes and plugins available. Great! So do we have any that have password listed or are the ally ‘x’ meaning that it’s being pulled from shadow file? Nope, doesn’t look that way. So we know that WordPress was pretty default and it looks like one of our users is wpadmin. Lets try and see if we can ssh into that with a default/weak password. BOOM! We’re in and got our first shell! Lets see where we’re at and what’s in this directory. Ok so now what we have a shell we need to get some privilege escalation. One of the first places I tend to look is in the cron jobs to see what is running. So it looks like we have some stuff in cron.d which was first on the list. So lets take a look at whats in php5 file. What's that? Is that another hidden flag? "# Its always a good idea to check for crontab to learn more about the operating system good job you get 50! - d46795f84148fd338603d0d6a9dbf8de". Interesting... Upon further reading of others walk throughs I confirmed that this is indeed the 3rd flag but we've still yet to get any privilege escalation so lets continue on. So we know it's running a WordPress site and we know it's running Apache. So lets take a look at what's in /var/www/ to see if we find any hidden gems. Hmm lets cat through some of these files and see what's in them. Seems we have a lot of files to comb over so lets make this a little easier. What I ended up doing was using "grep" to look through multiple files at once. Looks like 'root' has the password 'rootpassword!' so lets give that a try. That's it! We got all 3 flags at this point. Hope you enjoyed this walk through.